At The Devoted Barn we do a lot of work with our feral dogs and most people don't get to see it. We work on hand feeding, allowing petting, leash skills and even obedience. New people can be frightening to the ferals so most visitors at the barn do not really get to see the amazing progress these dogs are making. Check out the photos below to learn a little bit more about the feral way of life at The Devoted Barn! **This page is a work in progress. Please check back for even more photos of our feral program! This is Punky prior to when she came to The Devoted Barn. She had multiple litters of puppies and was suffering from a skin condition. She was in pretty rough shape. Zara remained in this shut down state for over two weeks. She only ate at night when absolutely no one was around. Otherwise she stayed exactly like this and never moved. Volunteers spend a lot of in the feral room just laying in kennels.! Once they are comfortable with us in their space we begin to challenge them a little bit by introducing touching and petting. It is an amazing feeling when they finally go from just tolerating your presence to actually enjoying your presence and wanting you in there. Twice a day, when the ferals come out for group play, we hand feed canned food as a special treats. This is a great way to encourage the ferals to approach us without scaring them. Hand feeding is a great way to introduce the ferals to other unfamiliar things such as children. 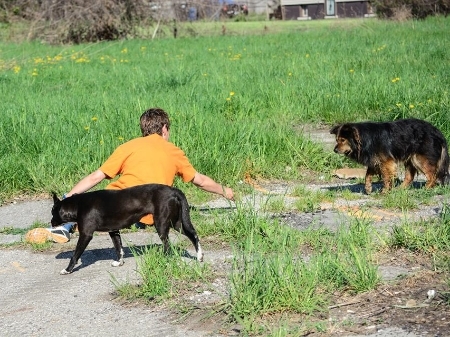 Catching a feral dog requires a lot of time spent building trust. Feral dogs can't just be "caught". They are too smart. They can only be caught once they begin to feel comfortable around you. The first step to rehab is just getting the ferals used to having humans in their space. Vanna & Elliott are both nervous but they aren't hiding even though there is a human. That is a great first step! Eventually the feral dogs become comfortable and accept us into their space. They relax enough to fall asleep and sometimes we even get a few snuggles! Touching and petting is very difficult for some ferals. Ryan refuses to be touched so instead of traumatizing her we do things to encourage her to touch us. She is getting very brave! Even with the yummy food it is difficult for some dogs to work up the courage to approach. Zara went 4 months without accepting food from us. Even once she did it had to be on her terms, Which is fine by us! After a little bit of time and hand feeding it turns out that children aren't so foreign and scary after all. Ava is now one of the feral's favorite people! Once caught, a feral dog completely shuts down. They won't eat and can't even feel touch. They try to play invisible by smooshing themselves into corners and becoming as small as possible. Even though Zara is still completely shut down here, volunteer Casey is just sitting in with her and sharing her space. Eventually she will learn that humans can share her space without hurting her. Sometimes they even demand it! Casey is Punky's favorite person in the whole wide world. One of the biggest parts of our rehabilitation program is building trust through hand feeding. Not all of the ferals are quite so shy when it comes to hand feeding time! We are always in need of people to come hand feed. If more people help, the ferals are more likely to generalize that all people are good rather than just the handful of people that work with them regularly.